One of the functions of WhatsApp Plus many will miss it safely and wanted to keep on your iPhone, is the ability to have shortcuts to contacts in the beginning, ie, on the main screen of your device, for thus a one click you can access send a message to that person you'd shortcut. For now official WhatsApp does not have that function, but there is an App that allows that, this is called Shortcut for WhatsApp Plus. The operation of this app is very easy: When we install and we open will allow us to add those contacts that we have them as shortcuts on the home screen, they will be in the form of widgets. Although to add contacts, we do it from the agenda of the iPhone, this is very easy and simple. After selecting contacts, we have to activate the Shortcut for WhatsApp Plus widget, this is done by pressing the edit button located in the center of notifications. Within editing must select searching through all the widgets available, that thus they may appear at startup and to select them. 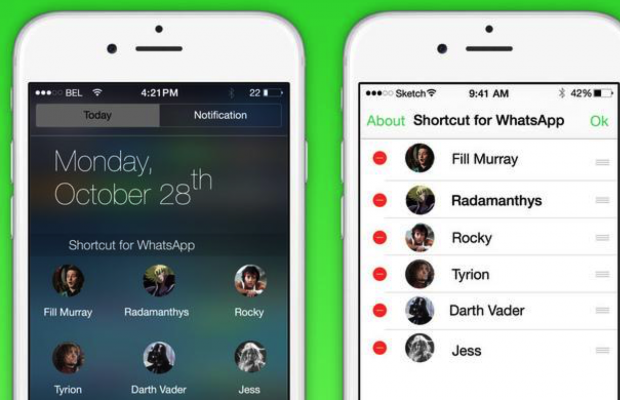 Shortcut for WhatsApp Plus is a free download, but only gives us 3 contacts on the home screen, if we put more we unlock the full version comes out at $ 0.99 this can put more contacts in the home screen, which sure many want, but if only 3 you settle, because free will be fine.